This beautiful retriever has a sleek coat with a wide muzzle and intelligent eyes. The Flat Coated Retriever has muscular legs and compact round feet. Flat-Coated Retrievers can be black or liver. 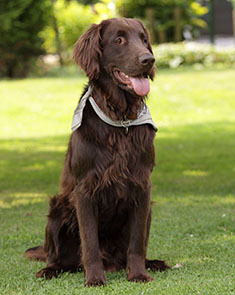 As its name describes, the Flat-Coated Retriever's coat is close to its body and feathers out at its legs and tail. 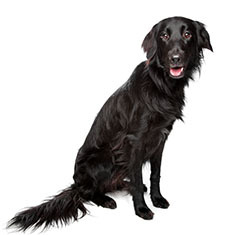 The Flat Coated Retriever requires weekly brushing and is an average shedder. Flat-Coated Retrievers can be prone to Cancer, Hip dysplasia, PRA, CHD, epilepsy and diabetes. Flat-Coated Retrievers live a average of ten years. The Flat Coated Retriever generally does well anywhere but thrives in the countryside. Flat coated retrievers are excellent swimmers. This breed is not well suited for apartment life and is generally inactive indoors. It requires at least an average sized yard. Flat coated retrievers are happiest with their families. They do best when allowed to live inside and play outside. 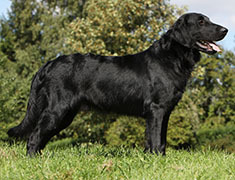 The Flat Coated Retriever is part of the Sporting Group. At first glance, you may believe you are looking at a black Golden Retriever when you see a Flat-Coated Retriever, but they are distinct and separate breeds. The Flat-Coated Retriever was bred in the United Kingdom as a gundog for both land and water retrieval of prey. Dog historians believe that Newfoundlands, Collies, and Setters were carefully bred together to produce this new breed in the mid- to late-19th century. The breed was very popular, until it was used to help create the Golden Retriever, which soon eclipsed it in popularity. The dog’s coat is moderately long, with a slight waviness along the back. 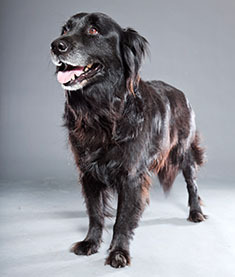 According to the American Kennel Club’s breed standard, the Flat-Coated Retriever should be 22 – 24.5 inches tall at the shoulder and should weigh between 45 and 75 pounds. 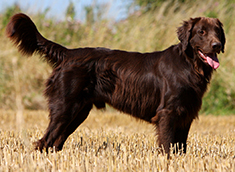 This makes them lighter than most other retriever breeds, and they have what is described as a more elegant appearance. The dog’s coat is moderately long, with a slight waviness along the back. Occasional grooming with a good brush is all that is required to keep the coat in good shape. The coat is always solid-colored, either in liver or in black. Some Flat-Coats are yellow, but this is a disqualifying fault in the conformation ring. The long, feathered tail never stops wagging, a reflection of the dog’s desire to play and his love for his family. The medium-sized almond-shaped eyes are widely set and must be dark brown or hazel. The nose is black on black dogs and brown on liver-colored dogs. The small ears lie close to the head, but are higher set on the skull than in a hound. The dog’s expression should be alert, intelligent, and kind. The Flat-Coat makes both a wonderful family companion and an excellent hunting dog on both land and water. The wonderful sense of smell Flat-Coats inherited from their setter ancestors has been put to use in the drug-detection arena, as well. The Flat-Coat makes both a wonderful family companion and an excellent hunting dog on both land and water. Because of their natural abundant energy, Flat-Coats who are not used in the field must have an opportunity for regular exercise. They also enjoy a good mental challenge to keep their intelligent minds occupied and to prevent destructive behaviors. Competing in obedience, agility, and field hunting trials can provide the necessary mental stimulation. While the Flat-Coat can make a nice watchdog by barking at strangers, he is not meant to be a guard dog and will not aggressively protect hearth and home. Often called the Peter Pan of the dog world, the Flat-Coated Retriever takes a long time to graduate from puppyhood. Expect to deal with their youthful exuberance for at least three to five years. Fortunately, these dogs are intelligent and very quick to learn, so you can train them in obedience to help keep their enthusiasm from spilling over into bad behavior. Flat-Coats are very people-oriented and think of themselves as part of the family. This is not a dog you will leave in an outside kennel and ignore until it’s hunting season. Rather, this is the dog that will follow you from room to room as you go about your daily business, often picking up a tennis ball or another toy in hopes that you have time to play. Although they are generally healthy, Flat-Coated Retrievers do have a higher risk of cancer than many other breeds. Some of the most concerning are hemangiosarcoma, fibrosarcoma, osteosarcoma, and malignant histiocytosis. The average lifespan of these dogs is just 8 – 10 years, with the most common cause of death being cancer. Although they are generally healthy, Flat-Coated Retrievers do have a higher risk of cancer than many other breeds. Hemangiosarcoma, which originates in the blood vessels, is extremely aggressive and spreads rapidly throughout the dog’s body. The cause is unknown, and the disease is generally fatal within one to three months of diagnosis. Fibrosarcomas occur in the connective tissue beneath the dog’s skin. They grow slowly and can often be successfully removed surgically, although reoccurrence is common. They may ulcerate through the skin, causing a secondary infection. Osteosarcoma is the most common type of bone tumor in dogs, normally affecting the legs. Treatment generally involves amputation of the diseased limb and chemotherapy to treat metastases, which are common. With aggressive treatment, a dog may survive one to two years after the initial diagnosis. Malignant histiocytosis is a disease of the white blood cells, which is often fatal within two to four months. It does not respond well to either chemotherapy or radiation. There are several different types of histiocytosis in dogs, and an accurate diagnosis is often difficult. Be sure your vet can differentiate between the types that are fatal and the types that will respond well to treatment before making any decisions about your dog’s future. Before purchasing a Flat-Coat puppy, ask your breeder to show you the results of tests done on their breeding stock for hip dysplasia and progressive retinal atrophy. The Orthopedic Foundation of America and the PennHIP program will certify a dog as free from hip dysplasia, and the Canine Eye Registration Foundation maintains a database of dogs found free from inherited eye disease. Is a Flat-Coated Retriever the right dog for you? If you’re looking for an intelligent, medium-sized, enthusiastic dog with lots of energy to spare, the Flat-Coated Retriever may be just what you’re looking for. However, if you cannot commit to giving your dog a lot of exercise for both his mind and his body, you’d be better off to look at other breeds. Grooming requirements are minimal, and the dog is reasonably healthy, although somewhat short-lived with an average lifespan of just 8 – 10 years. Find Flat-Coated Retriever Puppies with our Free Breeder search!